damon's boots. . Wallpaper and background images in the Ian Somerhalder e Nina Dobrev club tagged: nina dobrev ian somerhalder nian. This Ian Somerhalder e Nina Dobrev fan art might contain hip boot, thigh boot, aspirapolvere, soggiorno, salotto, camera anteriore, salone, and sala. 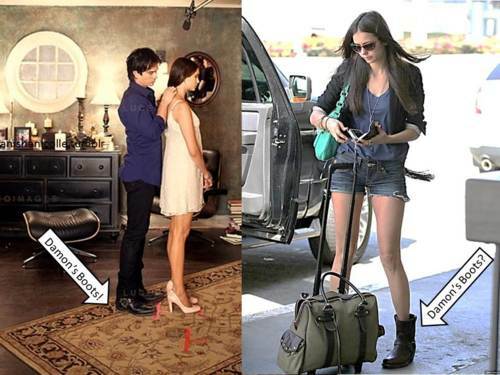 They are not Damon boots they look simlilar but Nina's boots are womens one and for sure are a smaller size.